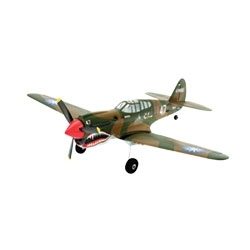 This Ultra Micro Series model is a thrilling recreation of the P-40 that you can fly almost anywhere. It comes equipped with the advanced AS3X® (Artificial Stabilization – 3-aXis) System that works behind the scenes to smooth out the effects of turbulence and torque. You’ll feel like you’re flying an expertly-tuned, Giant-Scale model that does exactly what you want.